It takes a couple of months to grow cabbage, but some varieties are worth the wait. Napa cabbage sometimes referred to as Chinese cabbage because it is believed to have originated near the Beijing region of China, is a large, puckered, tight-headed, fresh green with a flavor that is sweeter and milder than traditional cabbage. It is no more difficult to grow than traditional round-headed cabbage and very versatile in the kitchen. Leaves: The large, oblong leaves are crinkled and very tightly wrapped the head. The stalks are almost white and the leaves are a very pale green. Heads grow upright. Flowers: Chinese cabbage flowers are the familiar 4 yellow crossed petals of the cruciferous family. Napa cabbage is biennial. It may survive the winter under cover in USDA Hardiness Zones 4 - 7, however, it will quickly bolt to seed, in the spring. Napa cabbage can grow in full sun or partial shade provided it gets at least 4 to 5 hours of sun each day and plenty of water. Full-size heads grow about 20 inches tall and fill out to 5 or more inches in circumference. Napa cabbage takes about 70 to 80 days to mature. Because of spring's unpredictable weather, it grows better in the fall than the spring. Early spring sowings can be hit by frost or cold nighttime temperatures, which can signal that it is time to start setting seed and cause the plants to bolt. If you get past that hurdle, the warming temperatures will also tell the plants to stop growing and focus on going to seed. Although it is not impossible to grow Napa cabbage in spring and early summer, planting in mid-summer allows the plants to mature as the days cool, in the fall. Test for maturity by squeezing the heads. A mature head that is ready to be picked will feel dense, with little give. Napa cabbage is a very versatile vegetable. It can be used in recipes calling for either regular cabbage or bok choy. Individual leaves are often used as wrappers, for steaming or blanching. It is great for a mild, Asian inspired coleslaw and it also makes a mean Korean pickled Kimchi. Grilling it brings out its natural sweetness. Soil: Since Napa cabbage has a relatively long growing season, you will want to start with rich, well-amended soil. Start by digging in several inches of organic matter, such as compost or well-rotted manure. Soil pH is not a big concern but aim for something in the 6.5 - 7.0. Planting: If you choose to plant in the spring, either direct sow or start seed indoors about 4 to 6 weeks before your last frost date. Hold off sowing outdoors until after your last frost date or be prepared with some type of row covers. Plant seed 1/4 - 1/2 inch deep, spaced 6 inches apart. Thin and eat the thinned plants when they are a couple of inches tall. If you are growing full-sized plants, thin to a 12 - 18-inch spacing. Napa cabbages do not need a lot of tending. They do need regular water, especially during hot spells. Drought will cause bolting. If you amended your soil, you should not need supplemental fertilizer. However, if your plants look like they need a boost, use a fertilizer high in nitrogen, like fish emulsion or soy meal. Plants in the brassica family do not cross-pollinate with plants outside their species. Napa cabbage seed can be saved for 4 years. 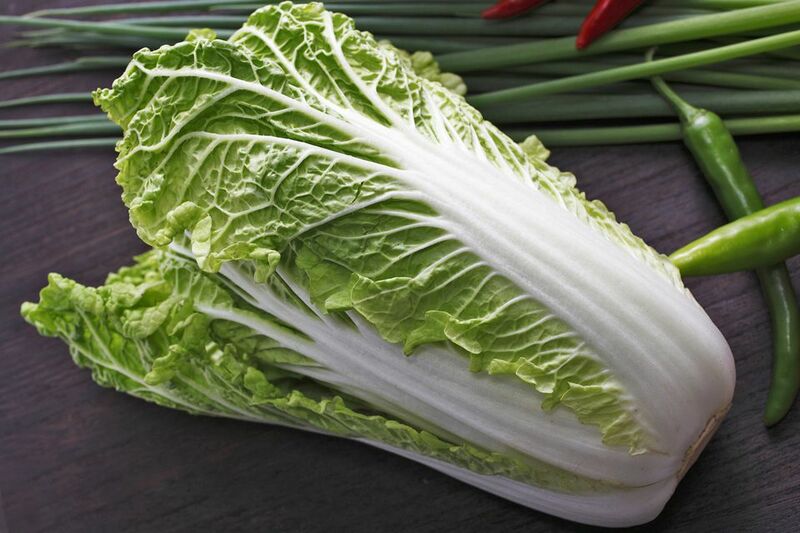 Napa cabbage does not share the quick growing advantage of many other Asian greens. This makes it a target for the usual line-up of brassica pests and diseases, including clubroot, cabbage yellows, black rot, and blackleg. Do not plant Napa cabbage in a spot that had brassicas growing in it previously. In addition to Cabbage worms, cabbage loopers, and flea beetles, be on the lookout for slugs and cabbage root maggots. Whiteflies and aphids are less of a problem.